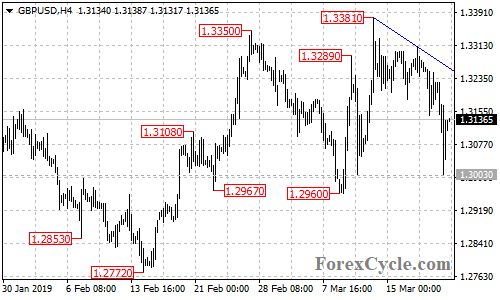 GBPUSD extended its downside movement from 1.3381 to as low as 1.3003. Deeper decline to test 1.2960 support is possible after consolidation, a breakdown below this level would aim 1.2850 area. Resistance is at the falling trend line on the 4-hour chart, a breakout of the trend line resistance could trigger another bullish movement towards 1.3500.